If x is the value of the present your mom expects for her birthday and y is the amount of money in your piggybank, what equation best represents your chances of staying on her good side this year? Don’t worry. This problem won’t appear on the SAT, but it’s a good example of why I love algebra: You get to play with little letters, even though you’re solving a math problem. If you love algebra, or even if you’d prefer to shred the pages of your algebra text, this ­chapter’s for you. Here, you find a quick-and-dirty review of the basics of SAT algebra, plus a spin through functionland, where f(x) rules. Note: Throughout this chapter and this book, I use the × multiplication symbol in problems that involve two or more numbers; whenever the problem involves variables, I use the · multiplication symbol. The base is the big number (or letter) on the bottom. The exponent is the little number (or letter) in the upper-right corner. • In x5, x is the base; 5 is the exponent. • In 3y, 3 is the base; y is the exponent. A base to the zero power equals one. I could give you a long, soporific (sleep-causing) explanation as to why a number to the zero power equals one, but you don’t really care, do you? For now, just memorize the rule. A base to the first power is just the base. In other words, 41 = 4. A base to the second power is base × base. The same is true for bigger exponents. The exponent tells you how many times the number repeats. For example, 56 means that you write down six 5s and then multiply them all together. • 56 = 5 × 5 × 5 × 5 × 5 × 5, which equals 15,625. • Remember that an exponent tells you to multiply the base times itself as many times as the exponent, so 23 does not equal 6 (2 × 2 × 2 = 8). On most calculators, you can do powers with either the “yx” or the “^” button. Just type the base, the appropriate button, the exponent, and the good ol’ “=” button. A base to a negative exponent is the reciprocal of the base to a positive exponent. This one is a little more confusing. A reciprocal is the upside-down version of something. (Here’s a conundrum, or riddle: Is the North Pole the reciprocal of the South Pole?) When you have a negative exponent, just put base and exponent under a 1 and make the exponent positive again. just sort of fades away. Don’t fall for the trap of saying that 5–3 = or . A base to a fractional exponent is a root of the base. Ah, more confusion. You’re already familiar with the standard square root of a number: because 52 = 25. Because it takes two 5s to make 25, we can also write . It works the same way with other powers. 53 = 5 × 5 × 5 = 125, so you can say that . And because 26 = 64. You can also do fractional powers on your calculator, either by using “^” and typing the fraction (in which case you must place the fraction in parentheses), or by using the “ ” button, which is usually accessed by using the second function key. To multiply like bases, add the exponents. You can’t multiply unlike bases. Think of it as trying to make dogs and cats multiply. All you end up with is a miffed meower and a damaged dog. To divide like bases, subtract the exponents. You can divide two bases that are the same by subtracting the exponents. Did you look at the second example, 59 ÷ 53, and think that it was 53? Falling into the trap of dividing instead of subtracting is easy, especially when you see numbers that just beg to be divided, such as 9 and 3. Keep your guard up. To add or subtract like bases to like powers, add or subtract the numerical coefficient of the bases. The numerical coefficient (a great name for a rock band, don’t you think?) is simply the number in front of the base. Notice that it isn’t the little exponent in the right-hand corner but the full-sized number to the left of the base. • 31x3: 31 is the numerical coefficient. • –8y2: –8 is the numerical coefficient. • x3: What is the numerical coefficient? It’s 1 because any number is itself times 1; the 1 isn’t always written out. Good trap. • 37x3 + 10x3 = 47x3: Because the bases are the same and the exponents are the same, just add the numerical coefficients: 37 + 10 = 47. • 15y2 – 10y2 = 5y2: Just subtract the numerical coefficients: 15 – 10 = 5. You can’t add or subtract terms with like bases with different exponents. In other words, 13x3 – 9x2 isn’t equal to 4x3 or 4x2 or 4x. All it is equal to is 13x3 – 9x2. The bases and exponents must be the same for you to add or subtract the terms. You can’t add or subtract the numerical coefficients of unlike bases. One term times one term: To multiply two terms, multiply their coefficients and add the powers of any common variables being multiplied; for example, (3a3)(–2a) = (3 × –2)(a3 + 1) = –6a4. Check out the section “Powering Up: Exponents” for more details about exponents. One term times two (or more) terms: Use the familiar distributive law: Multiply the single term by each of the terms in parentheses. Be sure to take your time and work out each product individually before combining them for the final answer. And your answer is 6b5 – 15b3. Two terms times two terms: Now, use my favorite four-letter word starting with f. Shame on you! I mean FOIL, of course. Multiply in the order First, Outer, Inner, Last. 1. Multiply the First terms: x · 2x = 2x2. 2. Multiply the Outer terms: x · 5 = 5x. 3. Multiply the Inner terms: –3 · 2x = –6x. 4. Multiply the Last terms: –3 × 5 = –15. 5. Combine like terms: 5x + –6x = –1x or –x. And your solution is 2x2 – x – 15. Memorize the following two special cases of FOIL. Don’t bother to work them out every time you see them. If you know them by heart, you can save valuable SAT minutes on test day. (a + b)(a – b) = a2 – b2. You can use this shortcut only when the two terms are exactly the same except for their signs. For example, (x + 5)(x – 5) = x2 – 52 = x2 – 25. Because this method uses only the first and the last terms from FOIL, I like to call it the FL method. (a + b)2 = (a + b)(a + b) = a2 + 2ab + b2. If I had a nickel for every time a student has messed this one up, I wouldn’t need the meager cash I’m making from writing this book. (Of course, I’d still be writing it; I’m here for you!) Check out the following example to see the rule in action. The correct answer is (D). Say it with me: FL doesn’t work here! Answer choices (A) and (B) are just wrong. If you do FOIL the long way, you get (x – 3)(x – 3) = x2 – 3x – 3x + 9 = x2 – 6x + 9. Or you could just use the formula: (x – 3)2 = x2 + 2(–3)x + (–3)2 = x2 – 6x + 9. Now that you know how to do algebra forward, are you ready to do it backward? You need to be able to factor down a quadratic equation, taking it from its final form back to its original form of two sets of parentheses. For example, given x2 + 13x + 42 = 0, solve for x. 1. Set up your answer by drawing two sets of parentheses. ( )( ) = 0. 2. To get x2, the first terms have to be x and x. Fill those in. (x )(x ) = 0. 3. Look now at the last term in the problem. You need two numbers that multiply together to be +42. Well, there are several possibilities such as 42 × 1, 21 × 2, or 6 × 7. You can even have two negative numbers: –42 × –1, –21 × –2, or –6 × –7. You aren’t sure which one to choose yet. Go on to the next step. 4. Look at the middle term in the problem. You have to add two values to get +13. What’s the first thing that springs to mind? Probably 6 + 7. Hey, that’s one of the possibilities in the preceding step! Plug it in and try it. (x + 6)(x + 7) = x2 + 7x + 6x + 42 = x2 + 13x + 42. Great, but you’re not done, yet. The whole equation equals zero, so you have (x + 6)(x + 7) = 0. Because any number times zero equals zero, either (x + 6) = 0 or (x + 7) = 0. Therefore, x can equal –6 or –7, not +6 or +7. You may also have to factor an expression like y2 – 49. This sort of problem probably looks familiar to you if you remember the FL formula (which I discuss earlier in this section): (a + b)(a – b) = a2 – b2. The expression y2 – 49 is known as a difference of squares because it equals y2 – (7)2. Any difference of squares can be factored into an FL product; in this case, y2 – 49 = (y + 7)(y – 7). Solving Equations: Why Don’t They Just Tell Me What X Is? You’ve probably spent a lot of time in school solving the two most basic types of equations: linear (for example, 3x + 5 = 5x – 7, whose solution is x = 6) and quadratic (for example, x2 + 13x + 42 = 0, which I solve in the preceding section using factoring). Every once in a while, the SAT makers also hit you with more complex algebraic equations: absolute value equations, rational equations, and radical equations. This section provides you a brief overview of these topics so they look familiar if you run into any of them on SAT day. Remember that most of the SAT is a multiple-choice test. When you’re presented with an equation that you’re not sure how to solve, you can always fall back on the ancient strategy of plugging in the answers one at a time. The correct answer is (D). Because an absolute value symbol turns everything into a positive number, the expression inside the absolute value could equal either 3 or –3. 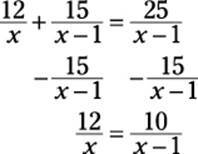 This is the key to solving an equation with an absolute value. If , then either something = n orsomething = –n. You must solve each of these equations separately to get two answers. But there’s a catch: You also must check each answer in the original equation. Only solutions that make the original equation true count in your final answer. Because both checks work, your answer is (D): 7 and 1. You could, of course, just plug in the choices to solve the problem. Remember those pesky grid-ins, though! Because not every problem is multiple choice, take the time to figure out how to solve each type of equation from scratch. No, radical equations aren’t a fringe group of equations the FBI is keeping an eye on; they’re equations that contain square roots. Check out this example, with a handy radical. Find the solution to the equation . Now don’t make the mistake of thinking that x should be 2; doesn’t equal 4. Instead, x is 16, because . Cross-multiplying gives you 12(x – 1) = 10x. Then 12x – 12 = 10x, and x equals 6. If you plug back into the original equation, you get 12⁄6 + 15⁄5 = 25⁄5, or 2 + 3 = 5, which means that your answer checks out. In a direct or inverse variation problem, instead of being given an equation to work with, the SAT makers tell you that two quantities “vary directly” or “vary inversely.” These expressions represent two specific types of equations that you’re already familiar with under other names. x and y vary directly. If x = 10 when y = 6, what does x equal when y = 21? or , and cross-multiply to get 6x2 = 210, so x2 = 35. Notice that when one variable increases, the other variable increases as well. This feature of direct variation problems helps you do a common-sense check of your answer. When two variables vary inversely, their product is always equal to the same number. For example, suppose that p and q vary inversely, and p = 3 when q = 12. Because pq = (3)(12) = 36 in this case, pq must equal 36 for all values of p and q. When p = 2, q = 18 (and vice versa); when p= 6, q = 6, as well. This strategy works for all inverse variation problems. By the time you get to functions on the SAT, you may think that you can’t . . . function, that is. But think of a function as a simple computer program: You give it an input and it produces an output. For example, x → 2x – 1 is a function. The arrow means that you put in a number for x (5, for example), and get out one less than twice that number as the result (9, in this case). The input and output can then be written as an ordered pair: (5, 9) is a member of this function, as are the pairs (1, 1) and (0.5, 0), along with many others. You’re most likely to see functions written as f(x). This expression, pronounced “eff of x” is somewhat misleading because it looks as though multiplication of some sort is going on, which isn’t necessarily the case. For example, f(x) = x – 4 is a function for which f(9) = 5, f(4) = 0, andf(1) = –3. When you put in 9 for x, you get out 5; when you put in 4, you get out 0; and when you put in 1, you get out –3. Notice that f(x) and y are the same thing. Notice that the number replaces x when evaluating the function. That is, f(9) = (9) – 4 = 5. Some students like the notation f( ) = – 4, because the box shows where the input goes. This is especially useful for complicated-looking functions, such as f(x) = 3x2 – 2x + x. What’s f(3) in this case? Well, if you write f( ) = 3 2 – 2 + = 3(3)2 – 2(3) + (3) = 3(9) – 8 + 3 = 27 – 8 + 3 = 22, you have the answer. Take the square root of a negative number. in those numbers gives you a denominator of zero, which is a no-no. Notice, by the way, that plugging in –2 is fine because it’s okay for the numerator of a fraction to be zero. At this point, you may be wondering, “Why are functions such a big deal?” After all, functions seem like a pretty abstract concept. However, it turns out that a huge number of real-life situations can be modeled using functions. To do well on the Math section of the SAT, you definitely want to be good friends with two of the most common types of functions: linear and quadratic. Instead of simply giving you numbers, the SAT writers may present a real-world situation and ask you to model it with a function. For example, if an express mail package costs $1.50 plus 40 cents per pound, you can write c = 1.50 + 0.40p, where c is the cost, and p represents the number of pounds. The roots or solutions of a function are the x-values that make f(x) = 0. 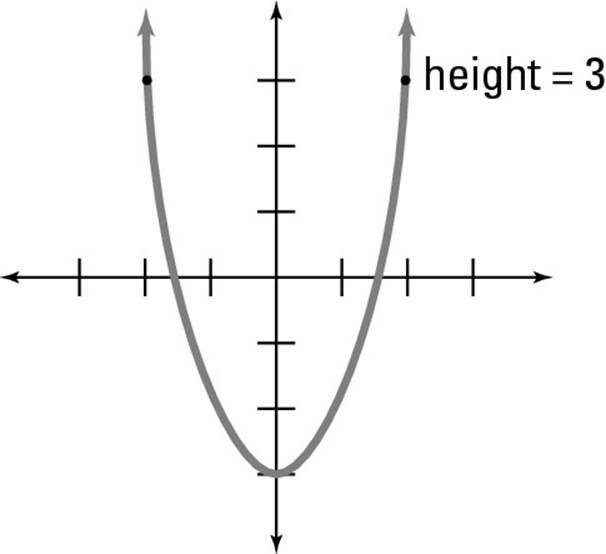 On a graph, the roots are the points where the graph crosses the horizontal x-axis. The number of solutions of f(x) = a is the number of points where the graph has a height of a. 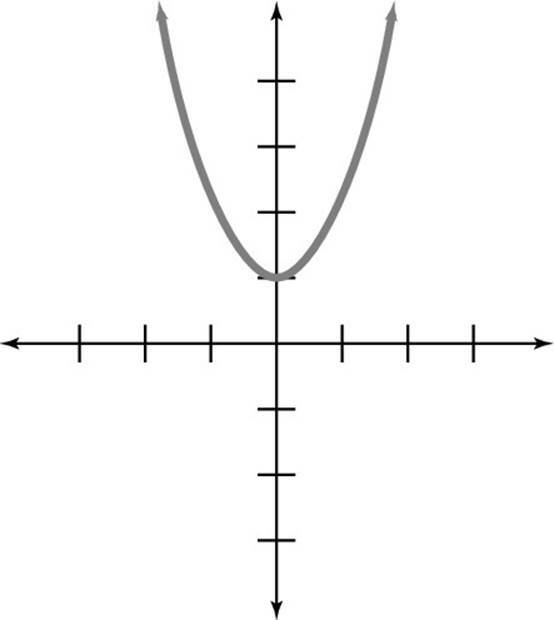 On the following graph, f(x) = 3 twice, at the marked points. Note that subtracting a number from a function moves the graph down. If a number is added to x in a function, the graph is moved that many units to the left. This rule is tricky because you may have guessed the graph moved the other way. 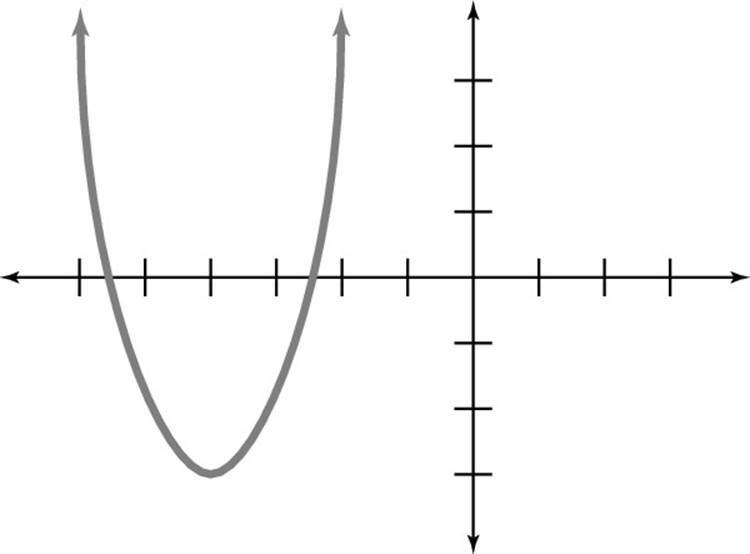 If the original function were changed to f(x + 4), it would look like the following graph. Notice that this rule is used when you’re adding to x, not to the whole function. 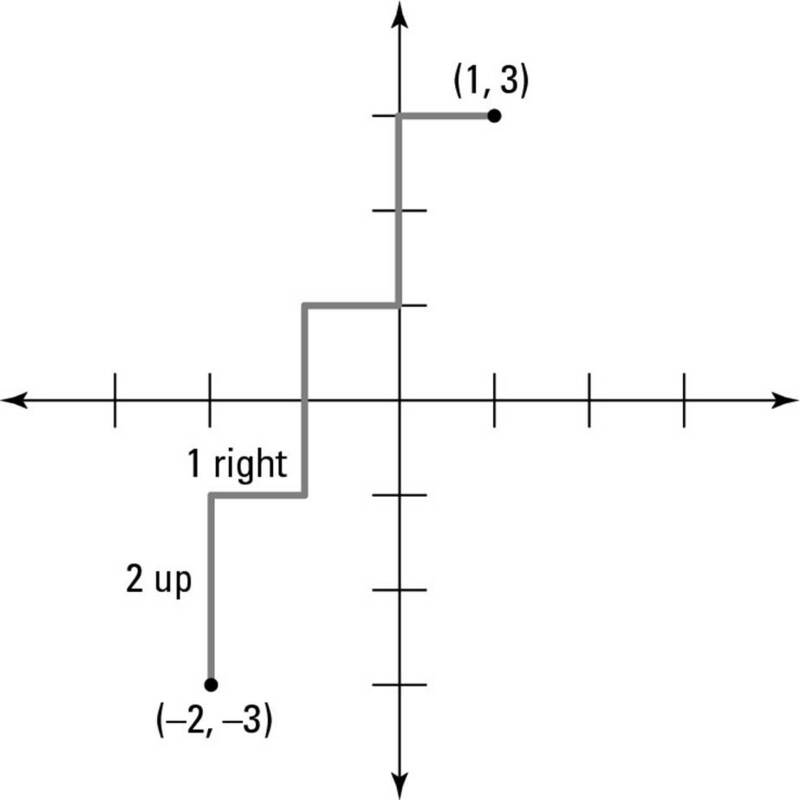 As you may guess, if you were to graph f(x – 4), you’d move four units to the right. Did your favorite grandparent send you a lucky rabbit’s foot (from a very unlucky rabbit) to insure success on the math portion of the SAT? If so, you probably expressed your gratitude (thanks) because you were grateful (thankful) and not an ingrate (someone who thinks the whole world owes him or her a living and, therefore, never appreciates anything). Waiters and bartenders, on the other hand, always appreciate gratuities (tips). Other grat words include gratis (free — you’ll be thankful for the gift, right?) and gratuitous (given freely but not necessary, like your mom’s criticism of your latest dating partner). You may find the grat family gratifying (filling one’s needs or desires) when they show up on the SAT. One of the most popular (to the test makers, that is) types of function problems on the SAT involves symbolism. In these problems, the SAT makers create a new symbol for a function. Look over this example, which uses < and > as symbols. If <n> = n2 – n, then which of the following is equal to <3> + <3>? Because <3> + <3> = <4>, the answer is (B).